It's now 1:26 PM in Detroit, Michigan, and it was exactly was 87 years ago that Houdini didn't die. Yes, he passed away in a physical form on October 31, 1926, but he certainly didn't leave our world. Because Houdini is as famous and as active today as he was 87 years ago. Maybe even more so. Houdini's very name has become part of our culture. A week doesn't go by in which there isn't a mention of a sports star, convict, politician or house pet "pulling a Houdini." A 4-hour miniseries about his life is currently shooting in Budapest (today is a shooting day, in fact). There are at least a dozen movie and TV shows about the magician in development. A big-budget Broadway musical is in the works. Several plays are being produced. There are Houdini rides and mazes at amusement parks from California to France. At least 2 new major books are being written about life and career. A new series of teen fantasy novels starring a young Houdini has just been launched. Appleton Wisconsin recently dedicated a new "Houdini Plaza." 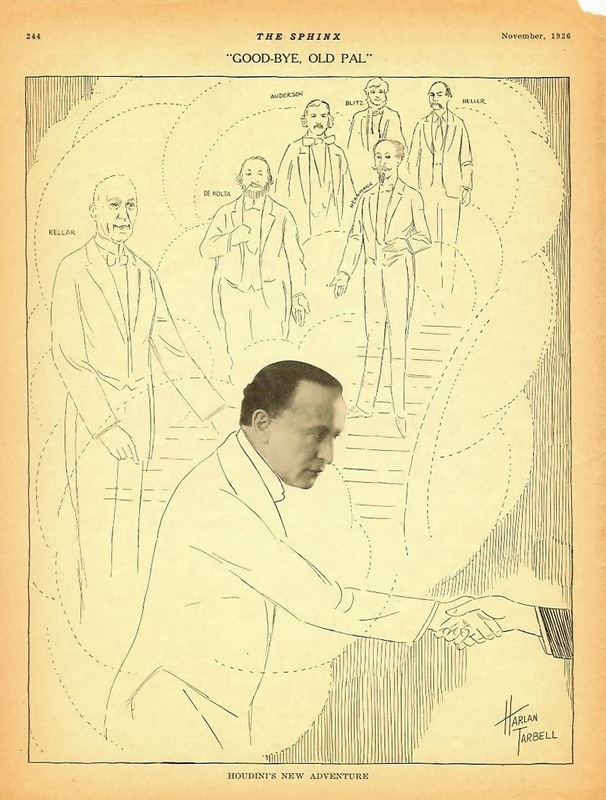 Official Houdini seances are being held today in Halifax, New York, Scranton, and Las Vegas. A 2-day "Houdini Festival" in Danville starts tomorrow. And, finally, there is enough happening in the world of Houdini that this blog is able to update everyday. All proof that after 87 years…HOUDINI LIVES! Houdini Museum: In Memoriam: How did Houdini die? Michelle Cushing: Houdini, Halloween, National Magic Day, and Me! Constance Phillips: Happy Halloween! Are You There, Harry? Houdini illustration by Harlan Tarbell appeared in the November 1926 issue of The Sphinx magazine (from my collection). Houdini does indeed live on!